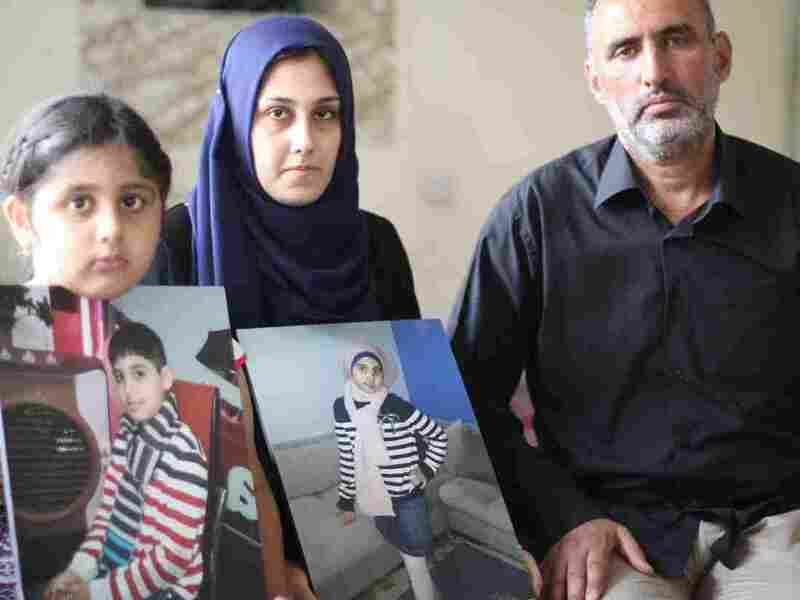 Iraqi Boat Family Warns Others: Don't Risk It, It's Too Dangerous : Parallels An Iraqi family returns home and tells the story of risking a trip to Greece on a boat that sank, drowning two of their children. But images of people making the trip safely encourage others to try. Zainab Abbas, husband Ahmed Hadi Jawad and their surviving daughter, Rawan, show photos of 10-year-old Zainab and 9-year-old Haider. The two children perished after a wave swept over their boat crossing the Aegean last week — the same boat carrying 3-year-old Aylan Kurdi and his family. Behind a rusty black gate in the rough-edged Shaab neighborhood of Baghdad, a home echoes with sobs as relatives mourn two children drowned as their family tried to get to Europe. The mother, Zainab Abbas, is pale and exhausted from weeping. "No one told us not to go," she says. Everyone knew she and her husband were poor and, amid Iraq's dismal security and economy, thought their best hope was to try to get smugglers to take them to Greece. The smugglers "are liars," she says. "They take money and send people to their deaths." Last week, when a wave swept over a boat crossing the Aegean Sea and washed Abdullah Kurdi's Syrian family into the sea, the poignant image of his son Aylan's body brought the plight of migrants into sharp focus. Abbas and her husband, Ahmed Hadi Jawad, were on the same boat and lost their children Zainab, 10, and Haider, 9. They sit with their surviving daughter Rawan. Jawad, his rugged face shocked with grief, tells me why he took his family to sea: money. "My life has become very difficult," he says. Jawad is an accountant who could only find work as a taxi driver. Life is tough for the poor in Baghdad. Sewage and garbage collection are terrible and electricity is more off than on. The kids slept on mattresses on the floor and asked him for bedrooms. "My son Haider — God have mercy on him — loved candy so much," Jawad remembers. But the boy knew his father couldn't afford to bring him sweets. "He said to me, 'I want to pay for it with my money.' "
He adds that his daughter Zainab was so smart at school, he wished he could afford a laptop for her. Jawad has five brothers who've been in Europe for years. They're not rich, but they're providing for their families. He says the smuggling route got cheaper lately, so by selling his taxi and borrowing, he scraped together $20,000 and hoped for the best. He wished it was more, but says, "I decided to take this risk with the amount I have." They left for Istanbul and made their way to Bodrum on the Turkish coast. He paid about $10,000 to a smuggler. Dodging police, they took taxis to the seashore in the dark and climbed on a boat with nine others, including the Kurdi family, who confirmed this part of Jawad's account. The trip was meant to be 30 minutes. His daughter Zainab was looking at her watch. "She said, 'Dad, I'm just counting right now — we passed half an hour, it's been 40 minutes.' "
Jawad says their life jackets wouldn't fasten. A wave pushed them overboard. Father, mother and one daughter stayed afloat and were rescued. Little Zainab and Haider got stuck under the boat and disappeared. Their mother breaks down as she unwraps photographs of the children. I ask what she tells the many people in Baghdad now trying to get to Europe. "I tell them don't risk this, it's too dangerous." Iraqi TV and social media are now flooded with images of people getting to Europe safely, encouraging more and more to take the trip. But more than 2,700 people have drowned in the attempt this year. Lise Grande, the U.N.'s humanitarian chief in Iraq, says the asylum process needs to be overhauled. "Certainly from the viewpoint of the U.N., you want a process that's put in place where the dignity and the safety and the voluntariness of people's movements is protected and ensured — and I don't think that's what we're seeing now," she says. It's common in Iraq to hear of people who've applied legally for asylum or special visas and waited years for a response. Grande says that makes people desperate and pushes them to take risks. "And that's why I think the discussions on public policy, about streamlining the process and making it more rational, making it more transparent and predictable — that's urgent and it's necessary," Grande says. But until that happens, it seems people will keep trying. One relative, even as he sat sobbing for the dead children, said Iraq is so hopeless that he'd still risk putting his kids on a boat to Europe in the hope of a better life.